ScreenSteps Desktop 2.9 and Workgroup DocumentationScreenSteps Desktop & WorkgroupCreating Word Templates Working With Word TemplatesHow Do I Generate the Table of Contents For A Manual Using Microsoft Word? When you export a manual to Word you will need to open the resulting file in a word processing program in order to generate the table of contents. 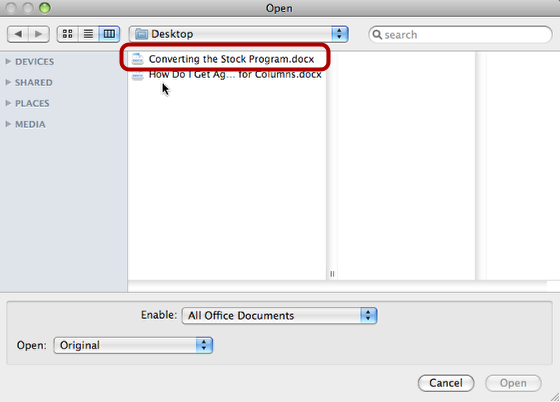 This lesson will show you how to do this for Microsoft Word. This lesson uses Microsoft Word 2008 specifically. 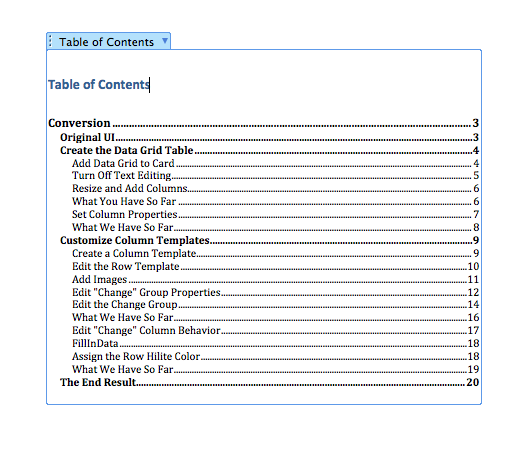 Locate the Table of Contents section in the document. By default this will be on the second page. 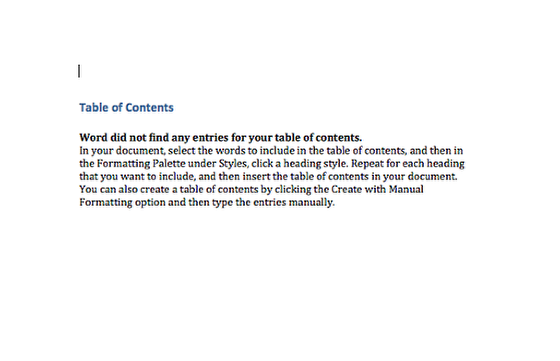 Click inside the table of contents area (1) in order to active the Table of Contents controls (2). 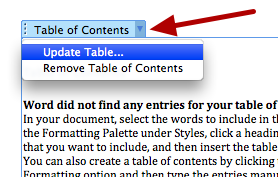 Click the arrow next to Table of Contents and select Update Table... from the menu. You can now save the document. Prev: How Do I Create A Manual Template? When I update the Table of Contents, the Chapter, Lesson AND STEPS are showing up. I'd like to remove the STEPS to de-clutter the ToC. Would you explain how to do that? Thank you! @Bob I found this article which answers your question. You would want to switch from level 3 to level 2. Thank you for the extremely quick response and the correct answer. I'm using Office 365 for Mac. For anyone else trying to follow those instructions, go to the Document Elements ribbon tab. In the Table of Contents section, look for the Options icon. The Options dialog contains the "Show levels" setting. Thank you!